Home Sports Danny Shelton Siblings, Net Worth, Is He Married To Yvonne Lewis? A 2015 first round pick, Danny Shelton is best known as the young star who once played defensive tackle for the Cleveland Browns. Though the Washington product was later traded to the New England Patriots, he remains a budding star whose field records are expected to increase at a prolific rate. A Washington native, Daniel Saileupumoni Shelton was born on 20th August 1993. His academic records show he attended Auburn Senior High School and proceeded to bag a degree in anthropology studies from the University of Washington. Shelton’s athletic inclinations were evident from a young age as he played football both in high school and then college, leaving outstanding records with each of the school’s team. Danny’s golden chance at professional play came in 2015 when fresh out of Washington, he was drafted into the NFL in the first round as the 12th overall pick by the Cleveland Browns. The 6-foot-2, 345-pound nose played defensive tackle for the Cleveland Browns for just three seasons before he was traded over to the New England Patriots in March 2018. Shelton was a full-time starter during his three seasons with the Browns and played a total of 44 games with the team. Though he never became a superstar in Cleveland, Shelton’s switch to New England was a move intended to establish him as one of the league’s better-run stuffers, shoring up a defense for the Patriots. A budding star who is driven by the desire for greatness, Shelton devoured opposing running backs with the NFL side. Danny became a free agent in 2019 after the Patriots refused the fifth-year option on his contract. In his young and promising career, Danny Shelton has so far enjoyed lucrative earnings. Over four years, the New England Patriots DT’ career earnings have amounted to about $11.7 million. His salary base in 2018 was $2 million and total compensation of $7 million in 2019. Having become a free agent in 2019, Shelton hopes to bag bigger and better deals in the future. For now, his total net worth remains uncertain. While the names of Danny’s parents are unknown, we do know he has Samoan maternal roots and Peruvian paternal roots. Danny and his four siblings (three brothers and a sister) were raised to uphold their cultural heritage with pride. However, Danny and his family suffered a great tragedy in May 2011 when Shelton was 17 and in his final semester of high school. In a devastating altercation trying to stick up for someone else, Shelton’s older brothers – Shennon and Gaston – were shot and while the former died, the latter survived a shot to the chest. In fact, Danny narrowly escaped being shot himself. The gunman had pointed the gun at him which jammed as he was about to pull the trigger and he quickly threw a chair at the gunman before taking him to the ground. That graduation period which was meant to be a celebratory one for Danny and his family was rather a very tough one. Thankfully, Shelton gradually rose through adversity and now plays for his brother every time he steps on the field. While in college at Washington, Danny wore the No. 55, a nod to his older brother. The number 55 is quite symbolic and dear to his family as that was his brother’s jersey number while he was alive. Though time may have helped ease the pain for Shelton, it’s been a lasting one and the NFL star has turned to his four dogs whom he considers as members of his family, to help him cope with the pain. An avid dog lover Shelton’s four furry friends are a pitbull called Moni, a husky called Juicy, a husky malamute called Mojo and a French bulldog called Juju. Is He Married To Yvonne Lewis? 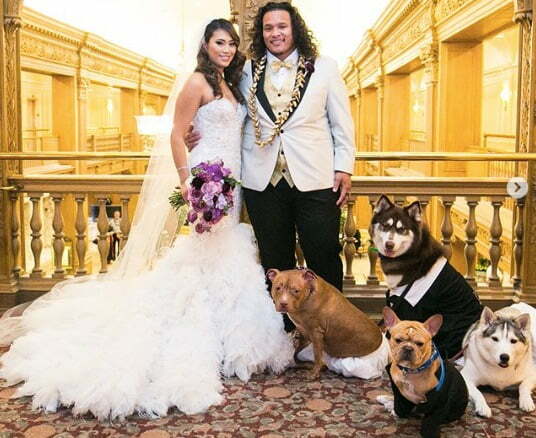 Danny Shelton is married to his longtime love Maria Tamara Mariano, who is better known as Mara. The couple’s love journey dates back to December 2012 and today the rest is history. Danny and Mara who got engaged in July 2016 eventually tied the knot two years later on the 24th of February 2018 (the 55th day of the year). Interestingly, Shelton who considers his dogs as his first kids made a big statement in his wedding with all four furry friends playing important roles as part of the wedding party. The two females Moni and Juicy joined in walking down the aisle adorned in their little white skirts while the males Mojo and Juju, wore little tuxes. Meanwhile, the family-oriented couple is set to increase in number as they are reportedly expecting their first child – a boy in the summer of 2019. Danny Shelton of the NFL is often mistaken for another Danny Shelton who is the president of a Christian ministry – Three Angels Broadcasting Network (3ABN). Recently, Danny of 3ABN reportedly got married to gospel singer Yvonne Lewis while Danny of the NFL remains married to his best friend, Mara.